As a fan of hilariously bad horror movies, I have a special fondness for “regional” horror films. Regional films are independent movies made in small cities and towns, often incorporating touches of “local color.” So when I found out that portions of such a movie were filmed in my old stomping grounds (Waltham, Massachusetts), I was ecstatic and vowed to track it down. The plot involves Forest Rangers investigating a series of mysterious murders. As time goes on, it’s discovered that the murders were caused by Native American demons freed from a series of portals. However, their attempts to warn the public and prevent the final portal from opening are constantly hindered by the owner of the Wild Goose Lodge, who wants the killings hushed up so the tourists aren’t scared away. 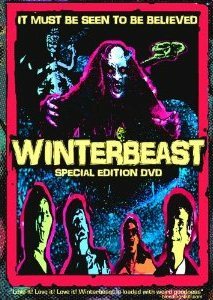 After semi-obscure 1992 VHS release, Winterbeast is finally back to take its rightful place as the greatest bad movie ever made. Part of the film’s charm stems the sheer variety of monsters in it, including (but not limited to) a cross between Bigfoot and a Sleestak, a living totem pole, a creature I’ve nicknamed “hell chicken,” and the titular Winterbeast. From what I can tell, the Winterbeast originally played a more active role in the film, but most of the footage of it attacking people got misplaced during the editing process. Since the film couldn’t be completed without those scenes, the filmmakers put together new stop-motion monster sequences to replace them. But the problems didn’t end there. For example, the lead actor shaved his mustache off during a lull in filming and had to wear a fake mustache for the rest of the movie. Unfortunately, this resulted in the size and shape of the mustache changing from scene to scene. These, the “homemade” nature of the special effects, the laughable acting, and the other surreal touches sprinkled throughout the film are sure to please b-movie fans. The transfer used on the DVD is quite acceptable considering the all the horror stories about the film’s production. Unless a millionaire takes a shine to it and pays for a restoration, this is the best Winterbeast will ever look or sound. The special features include a commentary, deleted scenes, a photo gallery, a “Making of” featurette, and a “soap opera” version of the film. You see, there was an attempt to shoot some scenes with a TV crew, but the videotaped footage was deemed unusable. Noticing that the scenes looked like something out of a cheap daytime drama, the people behind the DVD edited them together (and dubbed in some dramatic organ music) to give it the proper soap opera feel. Also, an easter egg of sorts can be found by highlighting a red symbol to the left of the “Soap Opera” icon. Clicking it will play a slideshow of sorts where the film’s composer, Michael Perilstein, discusses the upcoming soundtrack CD and other movies he’s composed the scores for. The commentary, done by Mark Frizzel (producer) and Chris Thies (director/writer), is equally informative and hilarious. Rather than try to spin the film as being better than it really is, both men are good humored about its reputation and gleefully poke fun at their creation. Not only does the commentary reveal why a movie called “Winterbeast” is set in autumn and has very little snow in it, but it also notes the film’s connections to Nickelodeon and The Corpse Bride! If you want some more information about the movie, or just want to order the DVD, please visit the official Winterbeast website. UPDATE: I noticed how the FlickRocket profile for Winterbeast notes how the film is “back to take it’s rightful place as the best bad movie of all time.” It’s been so long that I forget if my comment on how the film was “finally back to take its rightful place as the greatest bad movie ever made” was a play off that line or if they decided to paraphrase my review. It’s hard to say now that the website only exists in incomplete archival form and my contact at Winterbeast Entertainment Group passed away in 2015. May he rest in peace and hopefully his final horror movie Hooked will eventually see release. Special thanks to Winterbeast Entertainment for the review copy!